Just because a family home is relaxed and comfortable doesn’t mean it can’t be chic and stylish. 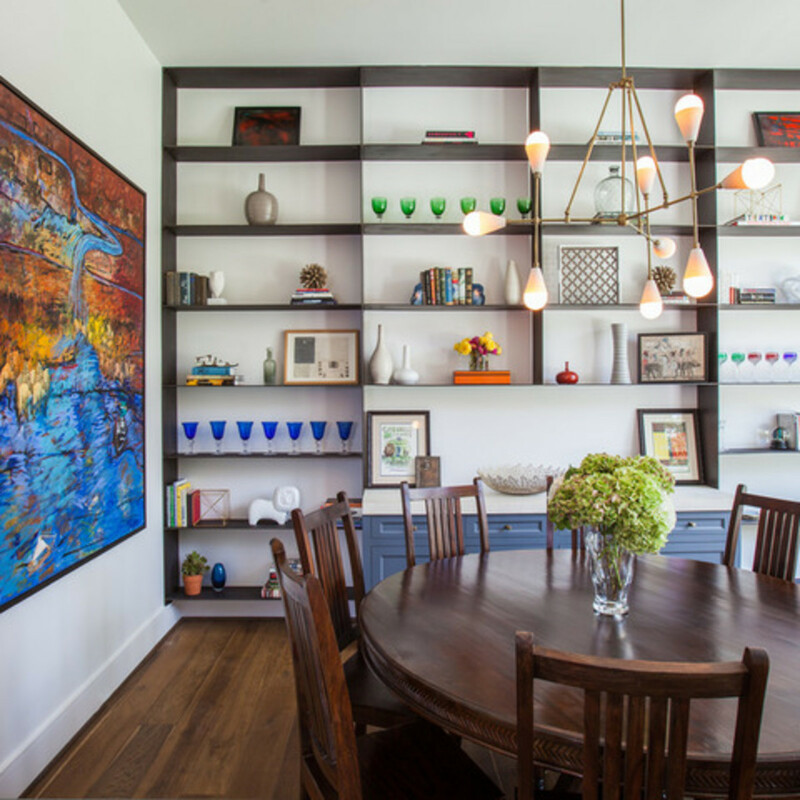 This Houston family wanted to make sure their new home had a fresh and eclectic feel and represented their personalities, showcased their art collection, and functioned for the fuss-free way they like to live. When the design team at Laura U saw their art collection, they knew crisp, gallery-white walls were the way to go, while the furnishings and accessories would drench the home in dynamic color. The homeowners are Rice University alums, and their favorite color is blue, no matter the shade. Hand-painted encaustic tiles in shades of blue make a strong impression as soon as one enters the foyer. An Alhambra-esque opening is an eclectic pass-through to the bar in the dining room. This is Southern hospitality we’re talking about, after all. The accessories help create cohesion between the modern, retro, and traditional pieces. Because the clients love to read, shelves made their way into almost every room. 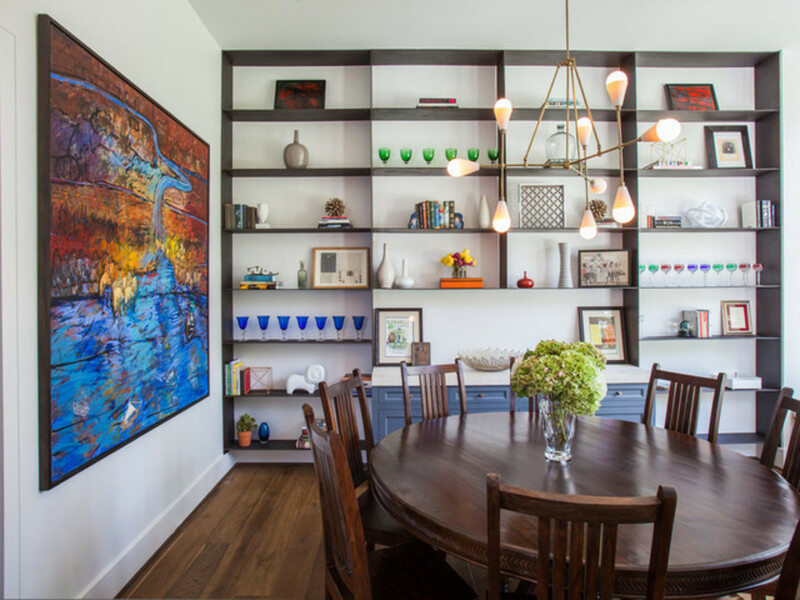 In the dining room, tomes were traded for colorful glassware, vases, and artwork, with lots of white space keeping a balanced look. The architecture is Spanish colonial, as seen in some of the details, like the ceiling beams. They add a warmth that works well with pops of bright color. 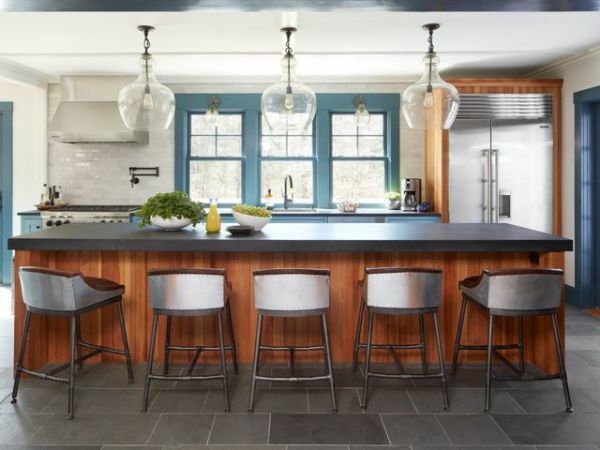 “The clients’ favorite color is blue, in any and all shades, so we made sure to incorporate this color in every room,” Umansky says. 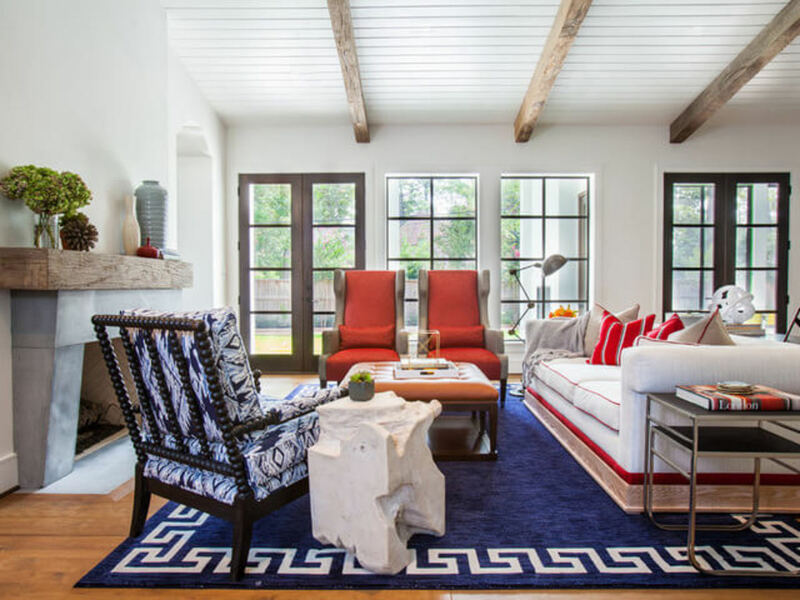 In the bright living room, a deep blue rug with a Greek key border grounds the space; the blue, white, and fiery orange-red are a fresh take on the all-American color palette. The sofa’s strong base got the design brew going. “The client fell in love with the oak base with the natural finish — it’s such a statement piece,” Umansky says. From there the Laura U team — led by Umansky and senior designer Letecia Ellis — selected pieces that complemented the sofa’s strong lines without competing with it. Wood in varying species and finishes, along with metals, adds to the textural mix. 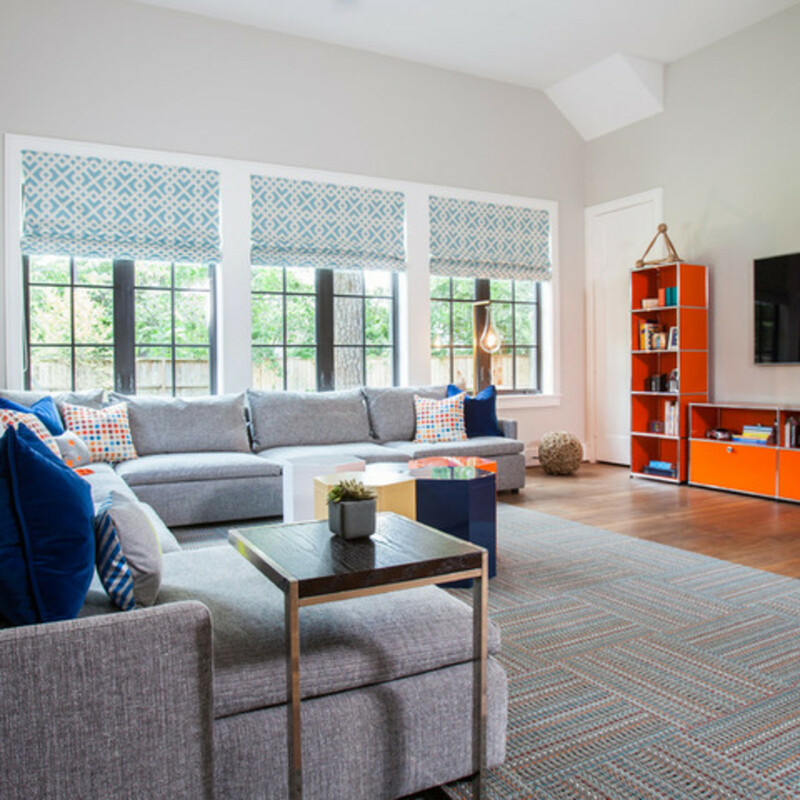 The family room is an even more casual space. 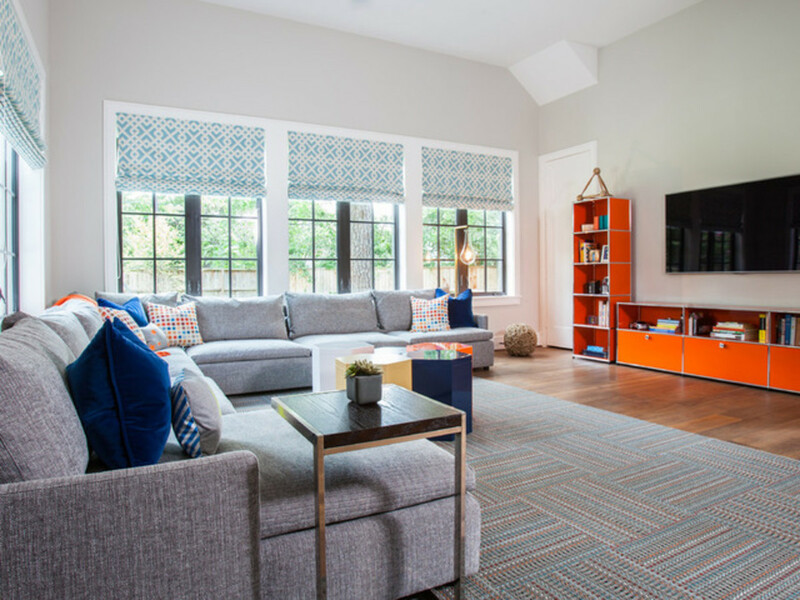 “This is truly a family room — everyone in the family uses it equally,” Umansky says. To keep things comfortable, light, and playful, the team chose USM storage in a vibrant orange. 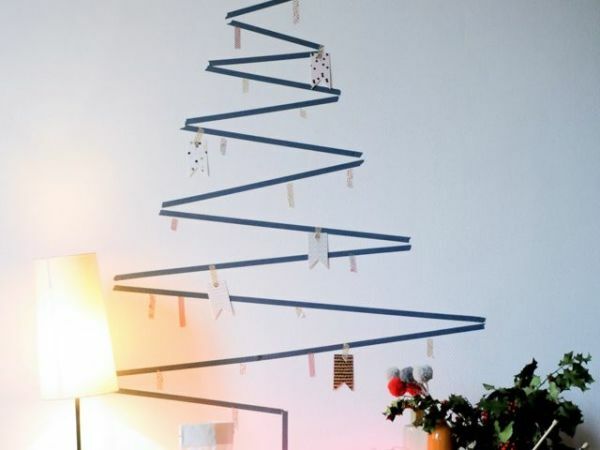 It adds a ton of storage for books, games, and toys and also infuses the room with color. The woven gray fabric on the sofa can withstand a lot of abuse, and so can the carpet tiles that compose the area rug. A barn door is another nod to Southern Americana, with its reclaimed wood lending some worn patina to the room. It leads to a hallway to the kitchen. In the kitchen, red window pane frames play off a red range. Vintage lights and a fresh farmhouse feel are nods to Southern Americana, while 1.25-inch-thick Carrara marble countertops add elegance. 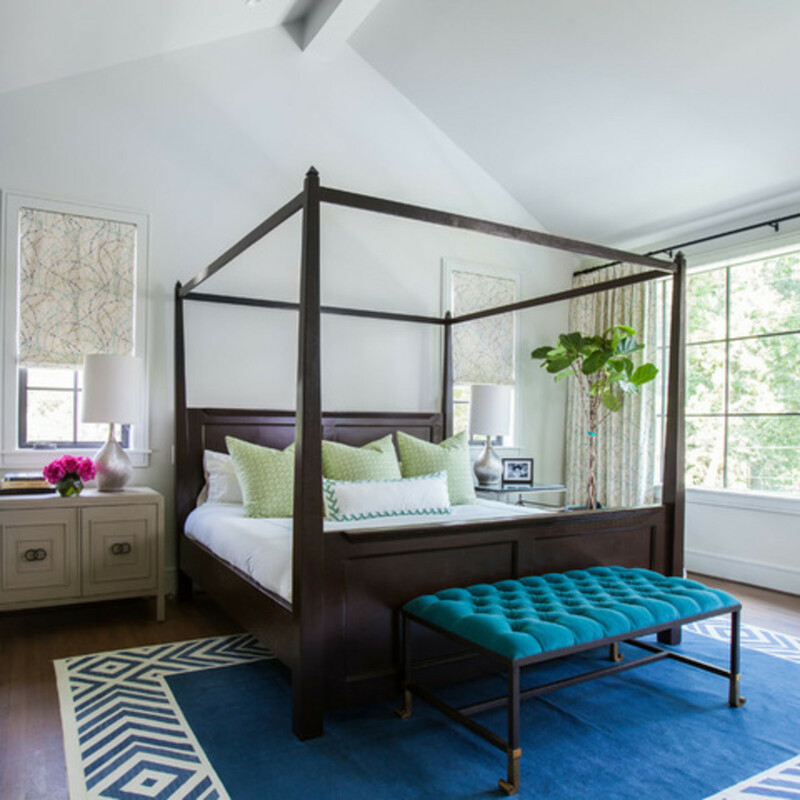 The casual feeling continues into the master bedroom, where the designers were going for an airy and cool yet comfortable feel. 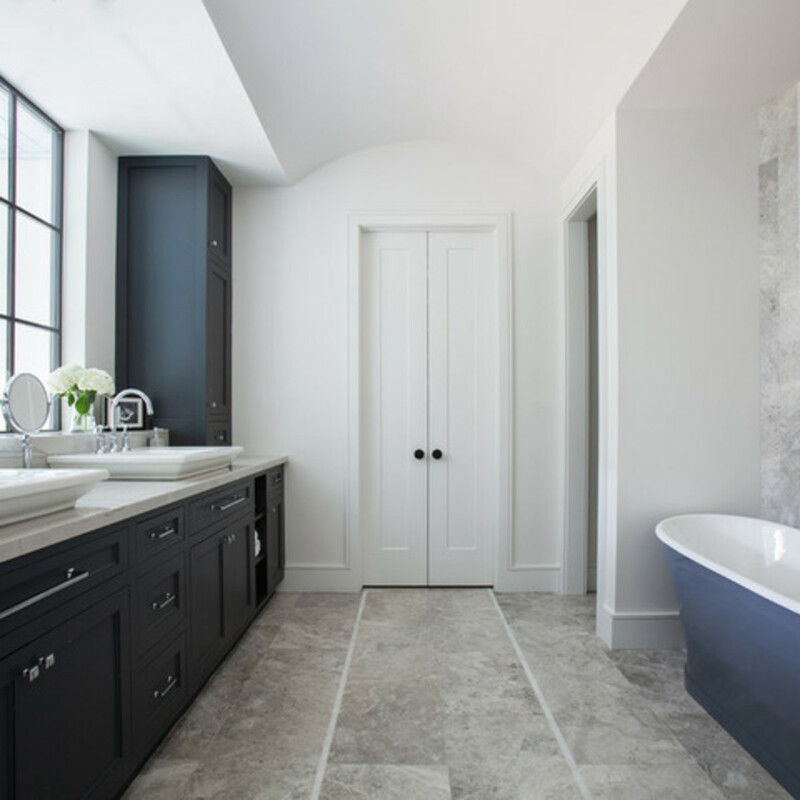 “Adding visual height becomes important when dealing with voluminous ceilings,” Umansky says. 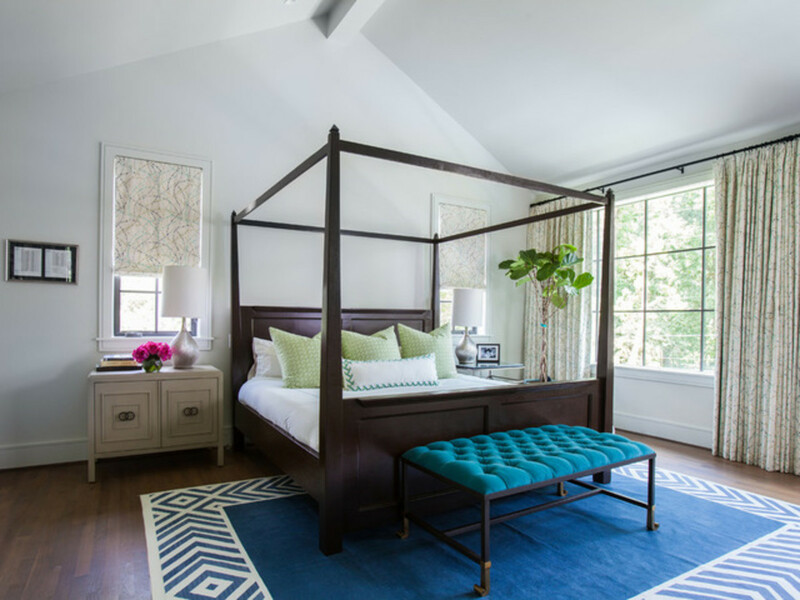 “The four-poster bed fills up the space and makes a grand statement.” The long wall of window treatments also stands up to the scale of the high ceiling. 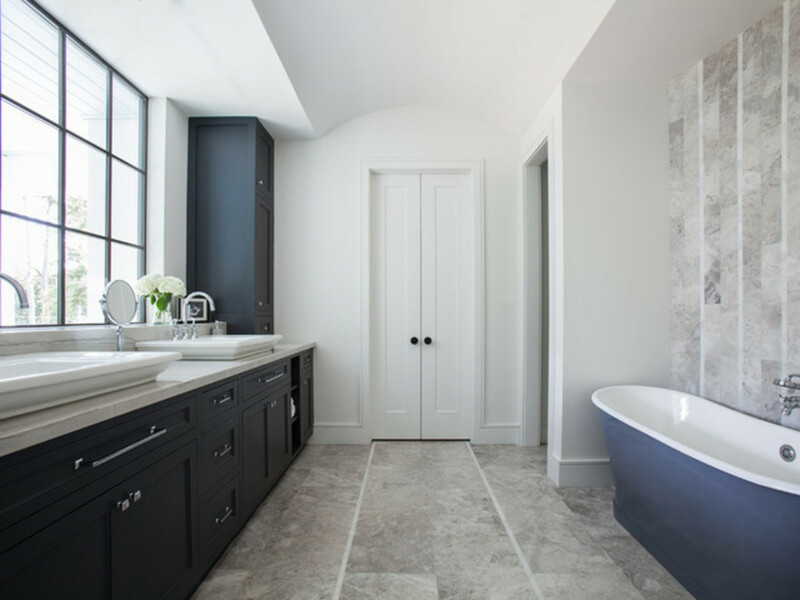 In the master bathroom, the designers created details like long, thin stripes in the tile, extending it up the wall behind the freestanding bathtub. 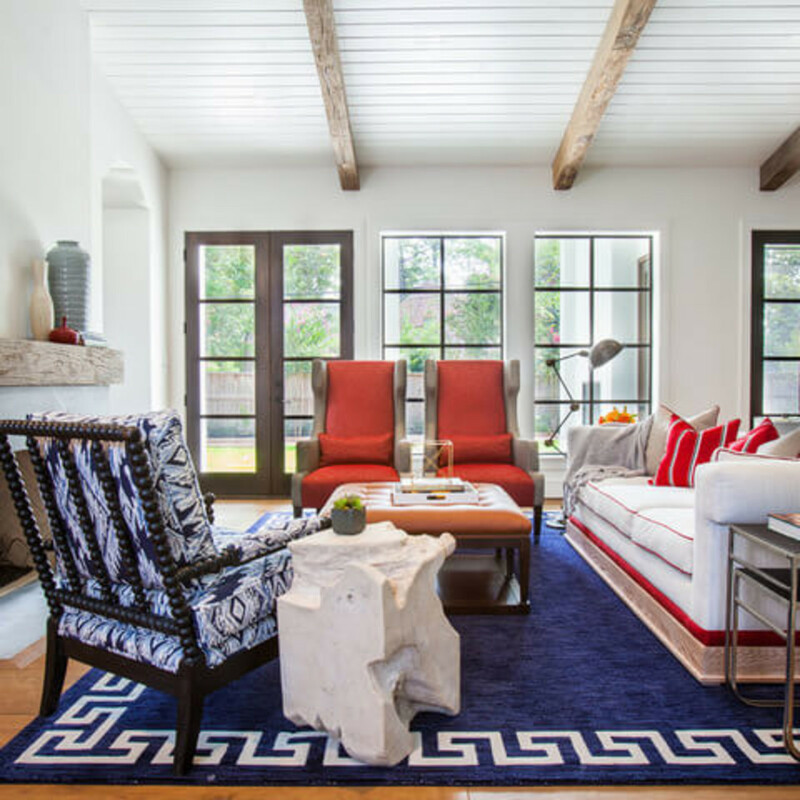 “This brought together the clients’ favorite colors: blue, white, and gray,” Umansky says. For babies and tots, Umansky recommends selecting elements like dressers and built-ins that can grow with them over time. “And don’t forget to have fun!” she adds. Starting with the homeowners’ favorite color, they layered in green and a fun wallpaper that depicts architectural icons from around the world, like Big Ben, the Colosseum, St. Basil’s Cathedral, the Great Wall of China, the Leaning Tower of Pisa, and the Eiffel Tower. 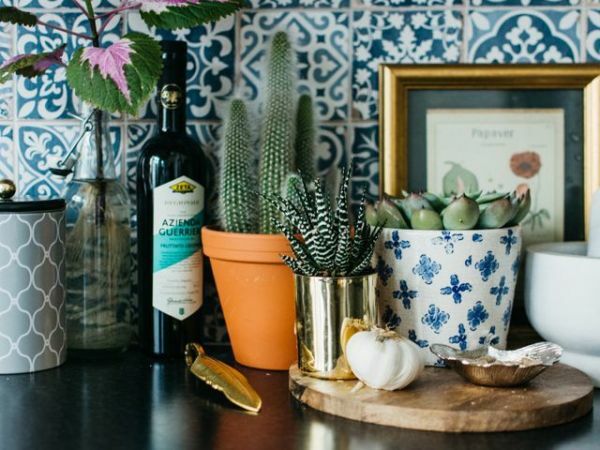 “It added texture and whimsy to the space,” she says. “You can’t have enough toy storage in any child’s room,” the designer says. Built-ins provide lots of places to tuck things away. Their 7-year-old son loves red and was excited to have a “big boy” room. He gave the iconic Alexander Girard alphabet wallpaper a big thumbs-up when the designers presented it to him. An upper bunk is known as the "Loft Lounge" and is for reading only, not sleeping, due to the lack of railings. Built-in shelves provide plenty of room for the son’s growing book collection and other favorite things. It also incorporates a desk for homework.